Two Canberra IT experts have hit the world stage by taking out the first-ever APEC App Challenge aimed at helping develop the export markets of small to medium businesses in the Asia-Pacific region. Canberra software developers Chris Gough and David Elliot beat 10 other teams from eight other countries to win the 24-hour challenge which involved furious coding as the clock ticked down. The challenge was held in Hanoi, Vietnam, to coincide with the recent Asia-Pacific Economic Cooperation trade meeting, with the winners presented with their award in front of the APEC representatives. “You don’t get a lot of opportunity to represent your country when you’re an IT guy and so it was a proud moment when we stood upon the stage in front of the APEC summit,” said Mr Elliot, who is an Executive Director of Agile Digital. The challenge was a joint initiative of the Asia Foundation, APEC, the Vietnam Ministry of Industry and Trade and Google, with the 11 teams of talented software developers flown into Hanoi to take part. They were challenged to come up with innovative apps and online platforms to help micro, small, and medium sized enterprises (MSMEs) leverage the internet to gain access to foreign markets. “Chris Gough and David Elliot, software developers from Australia, were awarded first place for their app, APEC CONNECT,” stated a report of the challenge from the Asia Foundation. Mr Elliot said the app also uses AusDigital standards to help small and medium business to record their trading history, building up an international identity. “It gives small businesses a pathway to start trading internationally,” he said. 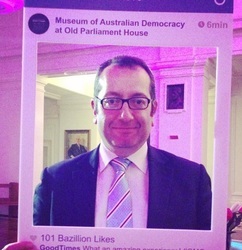 Mr Elliot said that the app itself is simple to use but that behind the scenes it is extremely complicated. He said that following on from the win, he and Mr Gough are in the early phases of organising a trial of the app in Vietnam. The App Challenge focused on MSMEs because they represent over 97 per cent of all enterprises in the APEC region and employ two-thirds of the region’s workforce. “The internet has dramatically cut the costs of exporting for MSMEs, and entrepreneurs are accessing new markets, integrating with global value chains, and growing their businesses in ways that create jobs and stimulate local economies,” the Asia Foundation report said. Second place in the APEC App Challenge went to one of three teams from Vietnam, who developed a marketplace and matchmaking platform for local artisans, AirLaLa. Third place went to a Malaysian team who developed Connect, an app designed to help inexperienced small businesses share information and knowledge on trade issues via an online platform. 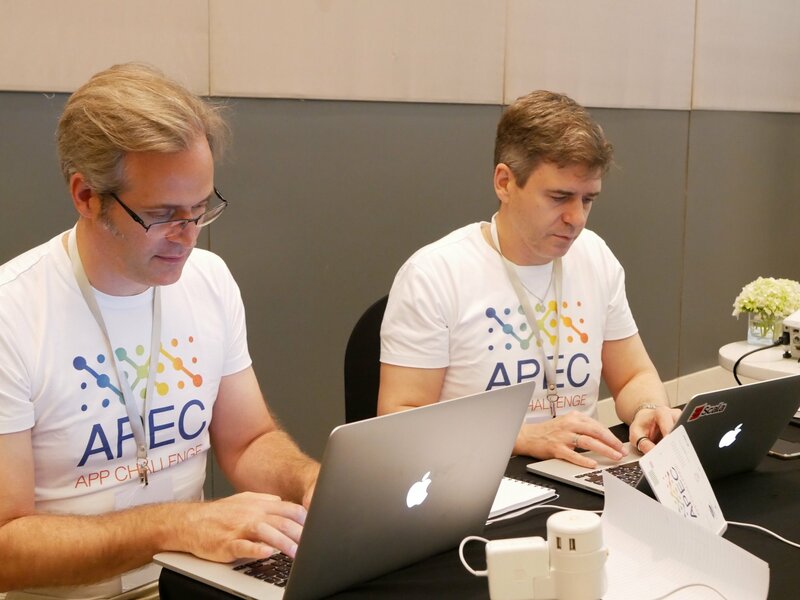 Top Photo: Chris Gough (left) and David Elliot at the recent APEC App Challenge in Hanoi. Below: A short video about the APEC App Challenge.